Yes Bartlett could not have played had Friday not been washed out so Jack would have. Bartlett could not have played had Friday not been washed out so Jack would have. Could not, due to his injury? Doesn't necessarily sound as though any further breakthroughs are imminent. Should we go on to prevail in this match, then LG bowling Samit, to end that stand, might well be one of the pivotal moments.... because that partnership looked like it had the potential to take them up to 300 or so. At this rate, I would think Jack Brooks should be glad that there are no more immediate CC1 games because, if there were, he would surely be a good bet to lose his place to TG. We've got Leach and Yorks don't have him. So I think we have less to fear on that score but whether our own batting can be trusted in this one, very much remains to be seen..
A very satisfactory day, so far. What a season Lewis Gregory is having - Stephen Lamb mentioned on commentary that he is fully fit for the first time for a number of years. At the risk of tempting fate, there don't seem to be any demons in the pitch. In my opinion, this is a 320-350 type track ("par"). In which case, we've got them out for about 70 or so short of that par. Whether our guys are in good enough form to ourselves achieve said par is, of course, open to question. Also, a change in overhead conditions is liable to equate to a change in par for the conditions. And tomorrow's forecast seems to be the worst of the four days (the most overcast). Poor decision given vs Azhar, IMO. Would probably have slid down. DRS might, possibly, have shown a third of the ball or something clipping the leg-pole but the batsman should have been given the benefit of the doubt. Marcus may want to put that hook shot away for now... a couple of unconvincing efforts. May be better to just bat conservatively for now. Scores looking high (300 ish and going well) in the three other division one games, where all the sides winning the toss chose to bat. Marcus and James gone in quick succession. Hopefully Tom is Abell to steady the ship. Their score looking pretty good now, unfortunately. 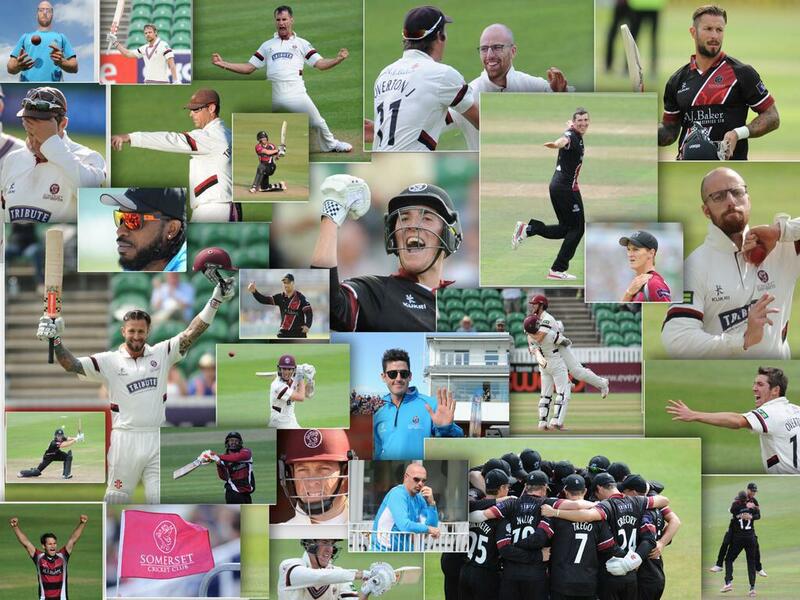 All those posters who last season urged Lewis Gregory to stop disrupting the Somerset dressing room and make up his mind to leave - when negotiations were under way for longer than usual over a new contract - must be rather pleased now they weren`t heeded. Top three made 30 between them - need some new blood - we will not win anything with that top order I am afraid ! Interested to know if any posters with comments on todays play are in Nottingham watching live with first hand knowkedge of play & conditions? Or just looking at the card and or a conputer fixed camera stream? Against a strong batting line up, and fast outfield on a sunny day we bowled a division 1 side out inside 2 sessions. If i was being picky we bowled a few too many 4 balls but if you want wickets you have to have attacking fields and pitch it up to encourage those edges. Broad is a test bowler with 400+ test wickets, he bowled well. Azhar LBW looked leggy live & on replays to me but hey ho. Hildy leg strangle to worst ball Notts bowled. Tom & George looked solid & saw us to the close well. Roll on 11am, we saw not 5 days ago how much fight this team has, lets see how things stand at the close of day 2. Parity-ish would set up a great final 2 days. We can all see the game on the live feed, WSM. It provides at least as good a view of the actual pitch as the vast majority of seats in any given ground do. The day was a paradox.. on the one hand we got them out for what I think was a below-par score for the pitch/conditions today. On the other hand, we certainly bowled too many four balls (and a couple of six ones). Had we been a bit more disciplined then I think we'd have got them out for a total absolutely indisputably below par. I don't think parity on first innings would much suit us, as we'd then be under the gun of having to chase something potentially significant in the final innings. 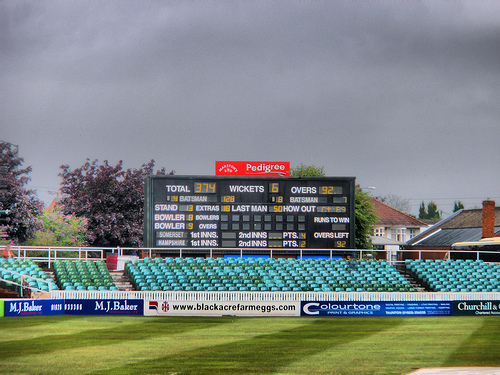 Therefore, difficult as it may prove - especially if tomorrow's forecast for more overcast conditions is borne out, I think we shall probably need to bat past them, preferably a distance past them, to win the game. I'm assuming you are talking about re-organising rather than replacing the top 3 taking into account one of them is our full season international and another is our most consistent batsman in the last couple of seasons. Who is the 'new blood' though? I can only think of bringing Ben Green back in or opening the door to Mr Lammomby. Marcus has to put some fitst innings scotes on the doors. Winning without bonus points loses you Championships. Found another candle so here is my Day 1 report. Edited 2 time(s). Last edit at 13/04/2019 20:19 by Grockle. Viz the pitch, Farmer, LG's take is that the track has a little bit of nip in it - but that it is slower than the Kent track, reducing the margin of error for the bowlers. I certainly think there was zero sign of the track being two-paced in any way and that would explain the confidence, on the drive, of the Notts batsmen, IMO. In some respects Notts bowled rather more accurately than we did (less to hit) - or perhaps, when they bowled bad balls they weren't just slightly bad - but rather utter rubbish, such as Broad's wide, another one that went over the keeper's head etc - hence they didn't get whacked for four or six off the bat, in the way that our guys did when they made minor errors of either dropping short or over pitching. Edited 1 time(s). Last edit at 12/04/2019 07:00 by AGod. A very interesting overnight position. I think we need to bat nearly all day and that must be the target for the day. We cannot afford to be behind on first innings. I don't think we should write off the top 3 when we are only half way through the second match of the season but I think we should change the batting order. 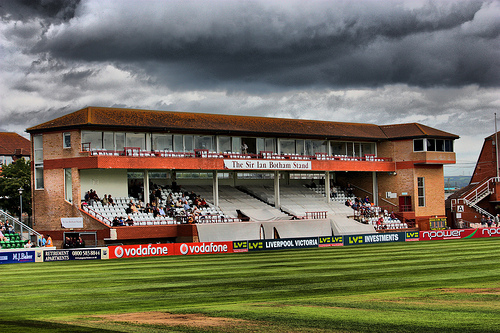 I would put Azhar down to 3 and find an opening partner for Trescothick. I was impressed by Byrom last year but if Bartlett is being given preference how about Abell opening. Didn't he start out as an opener? Certainly Hildreth should not be batting at 3 - I'd bat him at 5 but that's a particular bee in my bonnet! Angell Face - at the moment I'm afraid that we are putting James Hildreth's England ambitions ahead of our own ambitions. To be honest, I'd be happy to see either/both of Eddie Byrom and Tom Abell in the top three. Both men, and perhaps especially Eddie, seem to be mentally comfortable with batting for a long time, even it the scoreboard is not moving in dramatic fashion. And in the early part of a season, in particular, that's a valuable commodity. I think that Tom Abell may have confused himself a little. Yes, we all know that he had a very bad season two seasons ago. At the time, if memory serves, he was batting top three? Eventually he dropped himself (LG led the side to victory at North Marine Road) and then, later in the season, he came back in, I think at 5, and did a bit better. Then he had a fairly solid season at five last season. Yet he had previously made some good runs in the top three. I don't really think that the reason his form returned is simply that he dropped down the order. If I recall, prior to the annus horribilis he had been down in Australia and some coach there had meddled with his technique. That was identified, at the time, as a big factor in that year of famine. It may be that, whilst still growing as a captain he feels the need for a breather (mentally) after rigours in the field and that batting at 5 last year (4 now) affords him a little time to do that. But I think that, both temperamentally and technically, he is well-suited to a top three berth. It is well known (or at least widely believed - I suspect that there may be no statistical back up for this) that it seems that, when an all-rounder goes well in one suit in a given match, it often boosts the other suit. 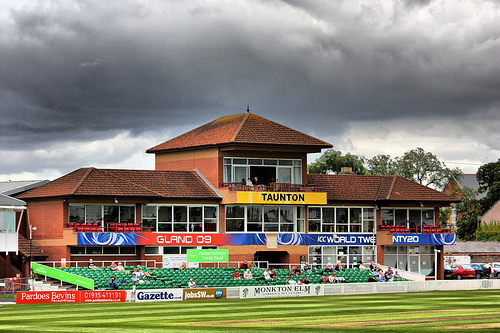 Didn't work for LG in game one, but I have the feeling that - if we are to get up, around, and preferably past the Notts total, we shall need some good runs from LG today so it is to be hoped that this idea will be in effect. It's hard to disagree with Lewis when he suggested that the first session today may very well decide the course of the entire match. Of course, it's possible that it might not do - for example, should we go into lunch on, say, 150 for 5 then nothing much will have been decided (other than that we'd still be in the game). 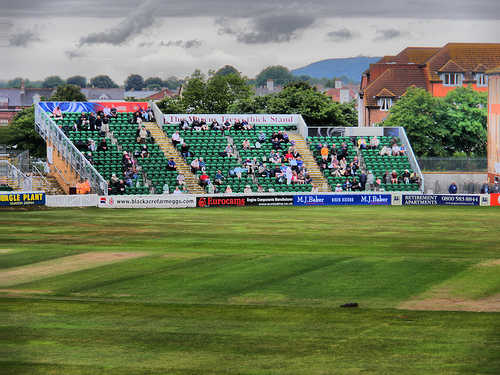 I'd say, that this morning's is a session that, if Notts win it, it will be tough for us to come back from. If we win it, then it sets us up for a chance at winning the game, though, of course, it's perfectly possible that, even were we to lunch on 165-3 or 170-4, then we might still not achieve much of a first-innings lead. 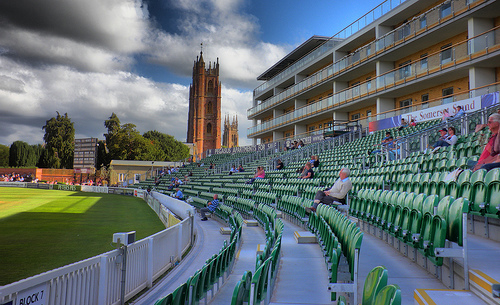 But if lunch see SCCC at 130-6 or, perish the thought, 7, then Notts will clearly be in the box seat. Interesting point being made on the commentary viz the change in the toss rules - Dave Bracegirlde is saying that Notts would have known, pretty much for certain, some five months ago, that they would be "invited," to bat first by Yorkshire.... and this gave the groundstaff five months to try to take the sting out of the wicket.... Had the toss rule not been in force, then it is likely that a much livelier wicket would have been prepared. Notts sub fielder is "Leverock," - not Dwayne, I trust, otherwise there might be a quick three to him at any point on the outfield! So that's the follow-on avoided. More good news is that we have gained two points on Hampshire, who have secured only one bowling point (unless they take a hat trick in the last three balls of over 110!) against our three.